With the festival theme of Revolution, Frequency 2013 welcomed over 15,000 visitors, immersing them in digital culture to inspire, challenge and encourage creative debate. 2013 saw the UK/European premiere of LA group WIFE, and 11 other World Premiere events, brought into the heart of Lincoln. With work from Lincolnshire-based, national and overseas artists alike, Frequency 2013 brought innovative, diverse work to Lincoln. From screenless animation, to video goggles, to projection mapping, we’ve explored the possibilities and the changing relationships between digital and art. Outside the not-so-traditional gallery walls, interactive media-art pioneers Blast Theory revisited their critically acclaimed audio-promenade experience Ulrike and Eamon Compliant with an entirely new ending. In an underground Roman gate-house, visitors were treated to a new ‘choreographed time’ installation by Trope Scope. The Juneau Brothers and Dale Fearnley restocked an empty shop with the technological relics of our own digital age, and a 13th century Friary hosted an exhibition of ‘analogue liberation’. Other highlights include an exhibition at The Collection, Where Are We Now?, exploring how new smart location technologies have changed the way we see people and places, through artworks including John Rafman’s Google Street View and Brian House’s Quotidian Record. As part of the same show, curated by Ashley Gallant, Paolo Cirrio’s Street Ghosts mapped portraits from Google Street View onto the age-old pavements of the Lincoln. WIFE can only be seen in the dark. WIFE works well with others. WIFE likes to play. Visually, WIFE is bold. Physically, WIFE is daring. Dreams are her driving force. She is metamorphosis. WIFE are a collective of three choreographers and dancers Jasmine Albuquerque, Kristen Leahy, and Nina McNeely who also work as teachers, editors and animators. Based in L.A, WIFE have been thriving in the underbelly of L.A. subculture, and we were pleased to welcome them to Frequency 2013 to make their UK debut. 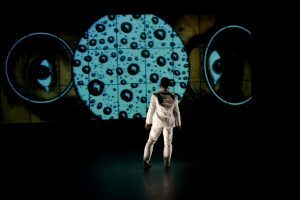 Describing themselves as ‘A Trinity of Illusory Performance Makers’ WIFE mix animation, projection mapping to create visceral, sensory performances, defying classification. They find their inspiration from myth, folklore, archetypes and the subtleties of everyday human behaviour. The challenge in making Blood has been to lose a fear of the technological revolution that is happening around us. Soon most of our interactions will involve a digital interface of some kind, and Blood brings these two worlds together. Human interface and technology. A captivating multi-sensory experience that goes beyond dance – Jean Abreu’s new work is a celebration of the strange beauty of life. Microscopic images of bodily fluids created by Gilbert & George from 1996-1998 are magnified and animated by digital artists Mirko Arcese and Luca Biada into a fluid, organic environment that both responds to and is manipulated by Abreu in this intensely physical performance. Blood is also the first time Gilbert & George have allowed their paintings to be used in performance. 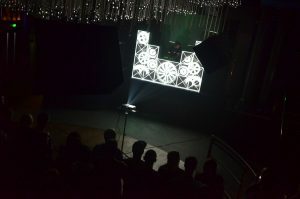 FREQUENCY 2013 hosted THE WORLD PREMIERE OF DIAL ULRIKE AND EAMON COMPLIANT. Mixing paint and projection, Urban Projections, created site specific piece of ever-changing art during a three-night residency at Frequency. Over the course of 3 nights a blank billboard transitioned through different states with to comment on the festivals theme of ‘Revolution’. 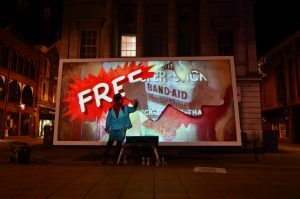 The states explored consumerist and political propaganda, recent forces of political change and a calling message to act NOW, encouraging the viewer to examine their own interpretation of ‘Revolution’. Watch Urban Projections’ film of Stylus at Frequency Festival.